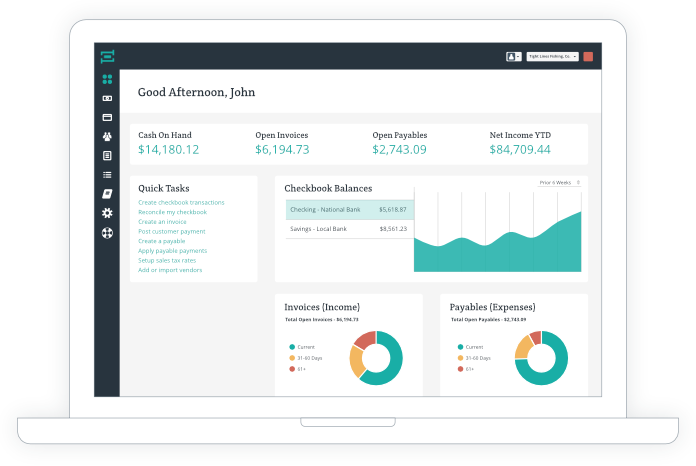 Crunched is an easy to use, cloud accounting software designed to help small business owners save time and make smarter business decisions. 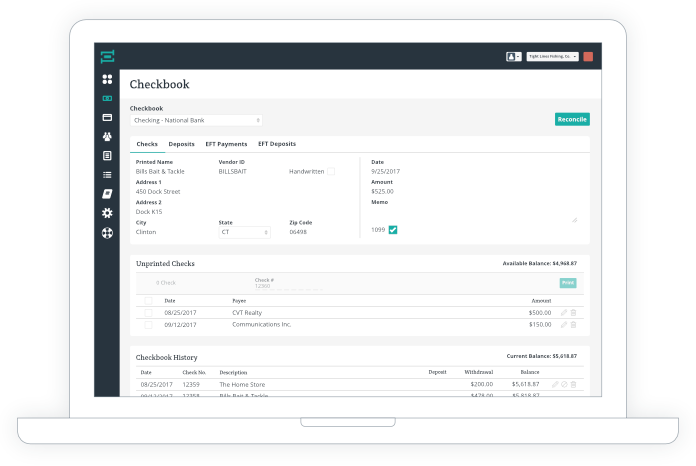 Send invoices, manage your expenses, and work real-time with your accountant. Whether you are a new business owner or have an established organization, you will quickly see the benefits Crunched offers. Select a category below, then hover over the outlined circles to learn more. Easily switch between multiple companies and save time by having all of your records in one place. Find tasks and functions with ease based on common terminology and a logically designed navigation. Gain insight into the movement of cash, seasonality trends, and cash high’s and low’s with a prominent cash flow summary of your business. Maneuver through the software at lightning speed with prominently placed quick links and jump directly to your most commonly accessed accounting tasks. Get paid faster by staying informed of who owes you money beyond their due dates with a prominently visible aging visual. Manage cash requirements for vendor and overhead expenses with a prominently visible aging schedule. Get immediate assistance with tasks by simply opening the in-app chat widget. You will be connected directly to a professional Crunched support specialists. Quickly switch between operating, savings, payroll, or other business checkbooks to post or view transactions, view available balances, and see reconciliation status. Save time preparing 1099’s at year end by tracking your disbursements to 1099 applicable vendors. Always know your true balance before printing checks and never overdraw your checkbook again. Scroll to view your checkbook register to view payment and deposit history, view distributions, and know the reconciled bank status. Know which payments are outstanding and deposits in transit with an account reconciliation interface, reconciliation reports, and a clearly noted checkbook register. Save time and print checks directly from the software. Crunched utilizes Deluxe pre-printed, high security, mid check stock for ease of quality and security. Offer your customers a simple, secure way to pay and accept credit cards with Crunched Processing. Customers can securely pay online, right from their emailed invoice. Send a quote to your customer for services for their approval or denial. If approved, the quote will automatically create a pending invoice for future posting. 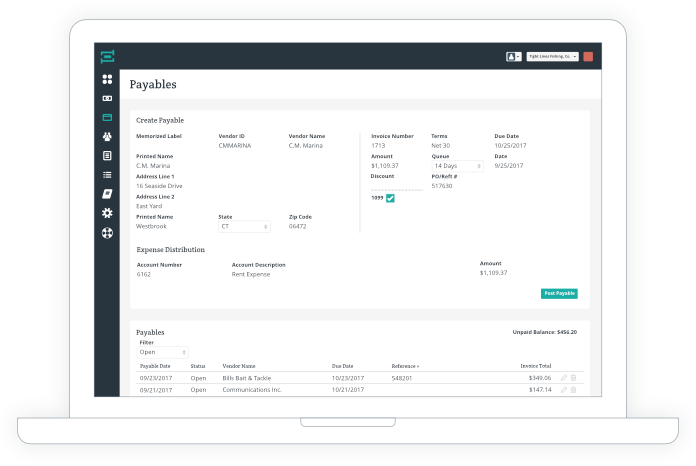 Receive customer deposits and apply them to open invoices. Then batch multiple payments into a single bank deposit and post to your checkbook. Edit posted invoices, email invoices directly to customers for secure online viewing and online payment, or print for mailing. Stay compliant and apply sales tax to invoices. Track liabilities and view sales tax reports for tax return preparation. 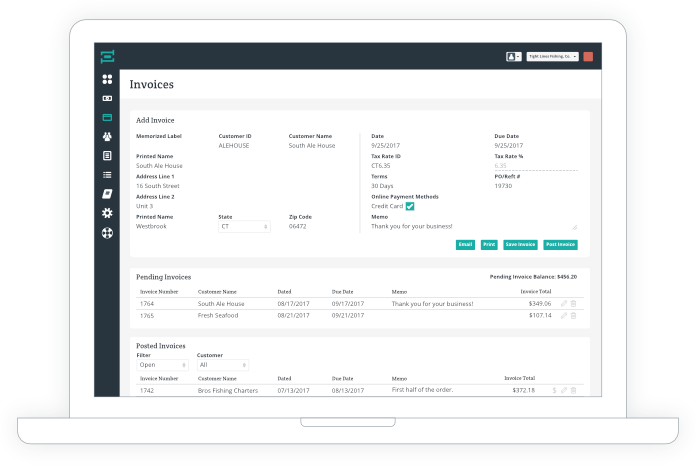 Filter invoices by status, customer or both. Have the ability to see which customers still have open invoices and easily send email reminders. Show off your business and custom logo by uploading it to your invoices. Present professional invoices to your customers and add value by emailing them directly to their inbox. Save time and print payables check runs directly from the software. Crunched utilizes Deluxe pre-printed, high security, mid check stock for ease of quality and security. View the aging status of payables and know your cash requirements for a standard, current, 30-60-90 day aging. Never miss a due date by setting a queued days count to be printed. This will allow for payables due within a set number of days to be automatically included in early payables check runs. Easily split expense distributions to various accounts for tracking divisions or departments. The main hub for managing your accounting systems administrative tasks allows you to quickly edit business information, set up account assignments, manage user profiles, and subscription settings. As the business owner you can invite colleagues to collaborate directly with Crunched. Simply invite your bookkeeper, manager, and accountant for seamless access. Manage your accounting system setup and set receivable and payable function account assignments as well as year-end income statement and balance sheet closing entries. Save on data entry and meet important deadlines by memorizing your transactions and setting them to automatically recur. This can be done for bank items, invoices, payables, and more. Easily manage your Crunched subscription to quickly upgrade or downgrade your account to suit your bookkeeping requirements. Crunched provides you with all the features you need to be successful when it comes to managing your records. With these features, you are guaranteed to save time and make smarter business decisions. Tired of your current solution? Are you already recording transactions but find yourself with a mess? Don’t worry, you’re not alone. Checkout how Crunched compares to other methods of bookkeeping. Enjoy some of our customer stories and see how Crunched helped them regain control of their books. "Crunched made it easy to import all of our current data, training was a breeze, and the user interface was easily understood."